I like video games. Like, a whole lot. Definitely more than the average person. Probably more than most human beings. I have always seemed to have a lot of “stuff” that celebrated that passion, but it was never coordinated in any meaningful way. That all changed when my new house came with a finished 3rd floor attic. I knew that this was going to be my mid-life crisis man cave, no question. I knew I was going to finally have an outlet to display this properly. Right media tower: Everything else. This is heavily dominated by Playstation, but Dreamcast has prime real estate in the top left corner. This still has room for expansion and holds some miscellaneous bulky items. Open wall space: I generally have themed items that correspond to either Nintendo specifically or the rest of the video game industry. If it isn’t obvious from looking at the collection, I pretty much prefer Japanese development houses…but not extremely Japanese ones (read: super weird…Japanese can get…weird). Most of my collection is pretty standard stuff from the major blue-chip companies. I have yet to find a truly great and robust tracking website to catalog game collections. The best I have found is IGN’s abysmal, and perpetually in flux, game collection feature. This is the latest snapshot I have of that. However, it is several years out of date. I should be well over 600 games by now. I absolutely detest EA, Ubisoft, Activision, and Microsoft (hence no Xbox footprint at all). They make garbage mainstream corporate junk; for the most part. But that’s a whole ‘nother post. The color theme of the entire room is “Oak and Black”. No surprise, the shelving units here are…you guessed it, oak and black. The middle black shelf holds no gaming related content at all. This is going to be remedied. With the growth of digital gaming, physical game collecting is…changing. Ironically, we’re seeing more and more “collector’s editions” of stuff though, so…I don’t know. I hope we never get to a point where a console is completely digital. That will be a sad day. Just be aware, the future looks kind of murky, but the past 20-30 years? Golden! Much like collecting DVDs and CDs, it can be very expensive! I tend to buy less than 10% of any game for full price. Price decay is so fast now, that within 6 months, a game will be available for half the price, at least (well, except Nintendo, they generally price decay, very, very slowly; if at all). Depending at where you are at in your “life” life cycle, you may not be able to play games…at all. I’m getting there. This makes 2) even more important because…most of my purchases end up sitting untouched and sealed for years! More money = more responsibilities = less time to actually do what you enjoy. Life is so unfair. First the boring stuff: the media shelves. The main ones are Prepac Triple Wdith Storage Rack (Oak and Black). These units are about as economical one can if you are looking to hold the amount of content as I am here. They were, relatively, easy to assemble. They look great and have a huge amount of flexibility in configuration. Lots of top shelf space, and since it’s not too tall, it ends up working great for displaying things. I love these shelves! Still, they’re not exactly cheap, but I have yet to find anything less expensive, for the value. I think I got the middle black shelf at Big Lots! at some point. Doesn’t matter though, it’s being replaced by this shelf also by Prepac. This allows me to have even height shelving, and opens up some more wall space (it’s several inches thinner)…which opens up some more interesting wall display options. The games on the Nintendo side include games from: NES, SNES, N64, Gamecube, Wii, Wii U, Game Boy/Color, Game Boy Advance, Nintendo DS, Nintendo 3DS. Pretty much everything Nintendo has ever released (well, I don’t have Virtual Boy…). The PS1 era will always hold special significance for me. Generally speaking, the onslaught of RPGs that were put out from ’97 to ’99 on PS1 alone were some of the greatest gaming experiences of my life. If you didn’t live through that era in real-time, it’s hard to describe. It was pretty damn amazing. I don’t think it will ever be topped. And then there’s Dreamcast. The weird kid on the block, with all these crazy games that no one had ever thought about making. I won’t go much into this (because I already have), but man, what a hell of a time ’99 to ’01 was. The overwhelming passion from that era can still be felt today. There’s a huge reason why my dead Dreamcast is displayed on the far right. It was a kickass system. It means a lot to me. Lots of random accessories like: Gold Wii Nunchuk and Classic Controller, Wii Plastic Guns, boxed Dreamcast controllers, and lots of special edition sets. My favorite is an official leather NES game holder. No idea where my parents got this, but it’s awesome. It can be seen in the very middle of the Nintendo shelf. It holds my NES games, as one would expect. The middle shelf contains a few video game sound tracks. What’s not seen in this picture is the CD rack to the left which holds several dozen more. I…uh, also, really like video game music too. Nintendo is more lighthearted, and amiibo is a thing, so…it houses my ever growing collection of amiibo. The right side is the more “serious”, “mature” side (by the way, I don’t actually think like this…fun is fun, people who dismiss quality for perceptions of…whatever, are totally failing at life), so it has more complex and expensive figures. These include, minus Vash, a Dark Souls No-name character, Big Daddy from Bioshock, Mitsuru from Persona 3, and Eleanor from Phantasy Star Online. All major, major, critically important symbolic characters from games in my video game history timeline. There’s room for expansion and rearrangement here, which I like. Limited edition light from Metal Gear Solid Revegenance. I’m probably going to move this elsewhere, but it’s pretty cool. This is something I’ve had a lot of fun with, and has taken years and years to come together. I feel like it’s finally solidified to a point where I can call it “complete”. I’ll continue to tweak this over time, but I don’t really plan on re-configuring any of this in a major way. What’s here is going to stay here for decades (at least that is my hope). Due to, what I assume is, major intellectual property issues, you can’t…umm…just go and buy these at the store. I have only found two, count ’em, two sellers that make these. I’m sure there are more out there, but I have tried pretty damn hard to find them to no avail. Both are on eBay: 75life and thinng. The latter has his own website. I was able to requisition several signs from him by working outside of eBay. You’d think someone on Etsy would sell something like this, but…nope. The takeaway I’ve found is that you need to do custom orders offline to have any chance at creating something like this. The signs under this category include: Nintendo, Sega, Konami, Umbrella Corporation, Capcom, Namco, Enix, Square, Atlus, and the circular Playstation logo. Like the plastic signs these are hand-made custom orders. The “?” Block from Mario and the Rareware logo are metal. I literally got them from a guy who was selling a few extra in an obscure forum. I have no way of reliably finding these again. This is the Chrono Trigger poster. Seller justbringit2010 sells this on eBay. He’s got dozens and dozens of different variations. I have no doubt he would take requests. He has PAL, JPN, and NA versions of a ton of games. These all appear hand made, but the source material is obviously widely available. You could literally do this yourself if you had the initiative. Looks like you just need a very high quality color printer and a frame. These include the Link, Kirby, and Playstation. These are generally more expensive and even…find. It’s very difficult to “search” for these things. Generally, these will be pretty unique though. I’m always on the lookout for stuff like this. It takes time. Collections don’t grow over night. This is 25+ years of effort. It does not have to be prohibitively expensive. I mean, it’s expensive, but all of this content was a “good deal”, in my opinion. Make it unique. There’s nothing fun about having exactly what someone else has. I’m always looking for unique items. My centerpieces are the signs and logos. I’ve never seen any other person display a collection like this. Next time, I’ll go in-depth on other pieces in the room. But, most are still in progress. 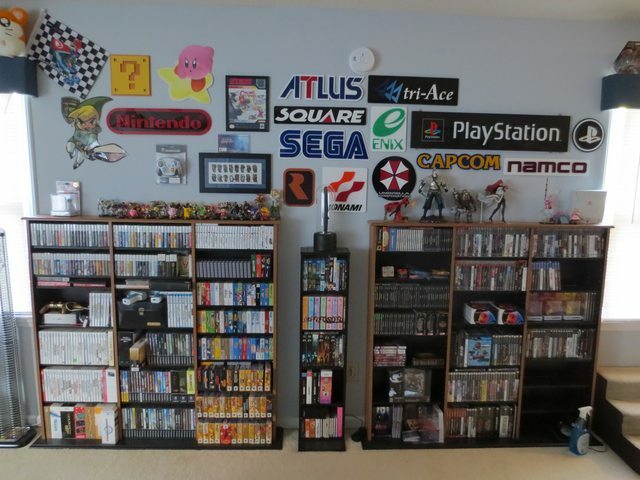 They include: a sports area, a music area, an anime area, and another shrine to Nintendo (note the lack of Club Nintendo on this wall; that’s not accident), as well as the game consoles themselves.